It feels like it’s rained here everyday for almost a week. I’m so glad we don’t live in town in the flood zone anymore. In the 1990s, my hometown flooded every four years. Anytime it would rain for a few days in a row, it seemed like everybody in the town would keep a check on the river. There would literally be a line of cars going across the bridge, turning around, and then coming back. The levees were completely rebuilt several years ago, so our town isn’t as apt to flood as it used to be. Well, anyways, Sunday afternoon the rain finally stopped and the sun came out. When I went outside to clean out the ducks’ pools, I took my camera along and got some pictures. I even got some new ones of Aubrieanne, the gosling we hatched out this year. She turned ten weeks old on Sunday, and I can’t believe how big she’s got. 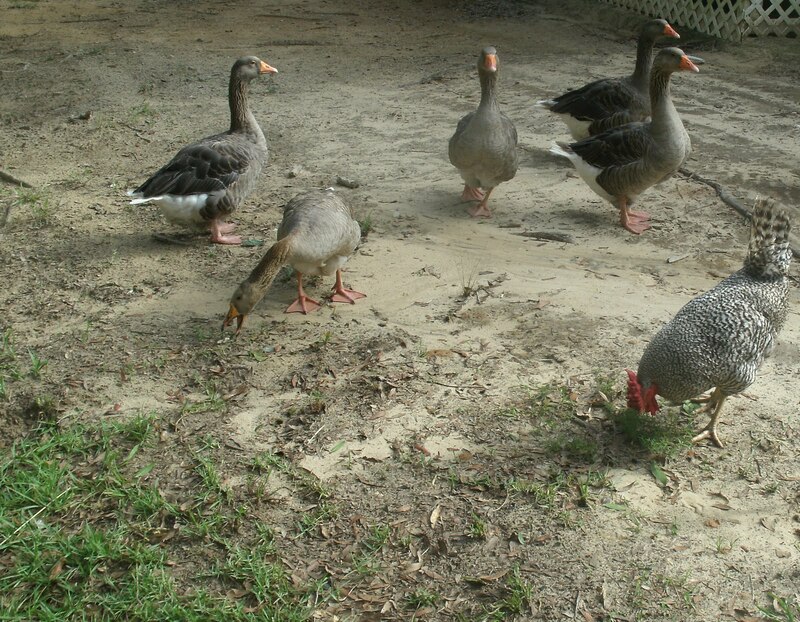 Hugo & his girls (they’re hatchery Toulouse geese). Aubrieanne is at the very back close to the roses (Aubrie is a Pilgrim goose). The geese & Lindbergh, the rooster. I love your geese! We have a tiny garden, so don’t have room for any, so I really envy you!